ELMHURST, Ill. – Two Summit League presidents were recently appointed to NCAA roles beginning with the 2017-18 academic year. North Dakota State University President Dr. Dean Bresciani was named to the Division I Board of Directors and Western Illinois University President Dr. Jack Thomas to the Division I Presidential Forum. Bresciani, who had previously served on the Presidential Forum, moves to the 24-member Board of Directors. The board includes a president or chancellor from each of the 10 Football Bowl Subdivision (FBS) conferences and 10 from the remaining 22 NCAA Football Championship Subdivision (FCS) and Division I conferences, the chair of the NCAA Division I council, one faculty athletics representative, one senior woman administrator representative and one student-athlete. "We look forward to Dr. Besciani representing The Summit League in this important leadership position," said Summit League Commissioner Tom Douple. "He is an influential leader and instrumental to the growth and success of our league. His experience on the Presidential Forum will be an asset to the Board of Directors." Thomas replaces Bresciani on the Presidential Forum, which is comprised of one president/chancellor from each of the 32 Division I conferences. 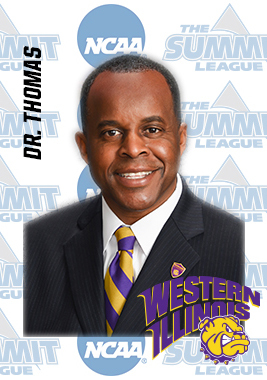 "Dr. Thomas is an extremely valuable asset to The Summit League's vision and strategy," said Douple. "He has a tremendous understanding of athletics and its role in higher education, both across our league institutions and in university settings on a national level." Celebrating its 35th season of Division I athletics, The Summit League offers 19 championship sports and has a combined enrollment of over 120,000 at nine institutions, including four located in top 60 U.S. metro populations and two land-grant universities. Member institutions include: Denver (University of Denver), Fort Wayne (Indiana University-Purdue University-Fort Wayne), IUPUI (Indiana University-Purdue University-Indianapolis), North Dakota State University, Omaha (University of Nebraska Omaha), Oral Roberts University, the University of South Dakota, South Dakota State University and Western Illinois University. Previously known as the Mid-Continent Conference, The Summit League rebranded in 2007 and has since produced eight NCAA Champions along with over 80 Academic All-Americans, 75 All-America selections and numerous former student-athletes competing at the highest professional level. For more information about the league, visit www.thesummitleague.org, follow The Summit League on Twitter @thesummitleague and watch the weekly "Inside The Summit League" show at www.thesummitleague.org/itsl.